For expert information and informative tutorials about choosing, using, and cleaning your wine refrigerator, check out our video guides below! 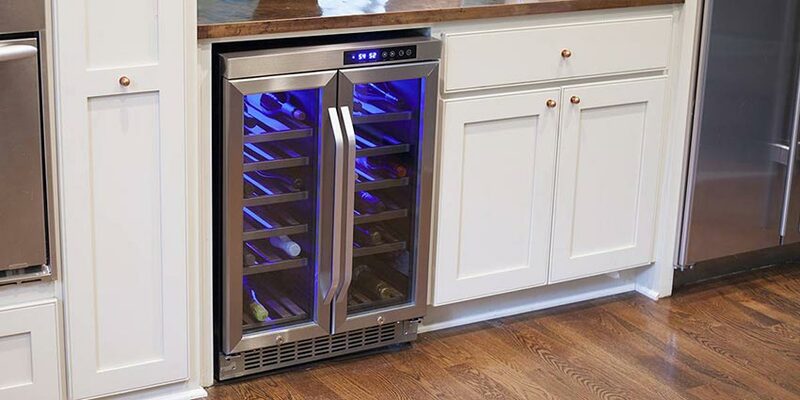 Scott, our Wine Refrigerator expert, provides a basic overview on the four types of wine coolers, their features, and the wines they suit best. Choosing the right wine refrigerator can be overwhelming due to the many types, options and features available to you. Watch as Brian discusses the three most common questions we receive about wine coolers. Click here to read our full FAQs. Watch this video to learn more about the Koldfront 32 Bottle Free-Standing Dual-Zone Wine Cooler and its impressive features. Store up to 32 bottles of your best wine in the sleek and stylish EdgeStar 32 Bottle Dual Zone Stainless Steel Wine Cooler (TWR325ESS) with elegant French doors. Due to this unit’s dual zone design, you can store both your reds and whites at their optimal temperatures. Store various types of wine at their optimal temperatures using the Koldfront 24 Bottle Free Standing Dual Zone Wine Cooler (TWR247ESS). This free-standing wine cooler has two temperature zones, both which use thermoelectric cooling to ensure that up to 24 bottles of your wine taste as the winemakers intended. Store up to 21 bottles of your best wine with the sleek and stylish EdgeStar 21 Bottle Dual Zone Stainless Steel Wine Cooler (TWR215ESS). Due to this unit’s dual zone design, you can store both your reds and whites at their optimal temperatures. Store various types of wine at their optimal temperatures using the Koldfront 7 Series 18 Bottle Free Standing Dual Zone Wine Cooler (TWR187ESS). This free-standing wine cooler has two temperature zones, both which use thermoelectric cooling to ensure that up to 18 bottles of your wine taste as the winemakers intended. Keep your wine stored and ready-to-serve at its optimal temperature using the Koldfront 16 Bottle Thermoelectric Wine Cooler (TWR160S). Able to hold a case of wine or more, this sleek unit is perfect for storing a budding collection or favorite selections. 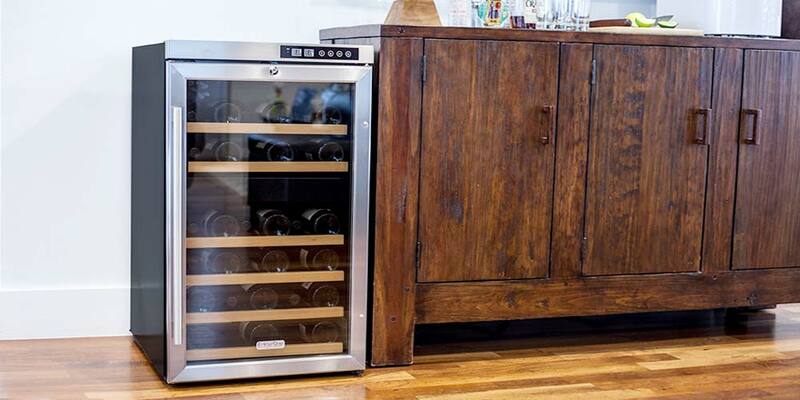 Store your best bottles of wine in the EdgeStar 166 Bottle Built-In or Freestanding Wine Cooler (CWR1661SZ). Able to hold up to 166 bottles of wine, this large capacity wine cooler is the ideal storage solution for growing wine collections. You’ll never have to worry about having enough room to store your red and white wine collection with the EdgeStar 155 Bottle Built-In Dual Zone Wine Cooler (CWR1551DZ). This super spacious wine cooler has 14 shelves total, 13 of which are full-size and capable of holding 11 bottles and a half-size bottom shelf that can hold up to 12 bottles, allowing you to store up to 155 standard 750 mL bottles total. Keep your wines chilled to perfection using the EdgeStar 53 Bottle Built-In Wine Cooler (CWR531SZ). 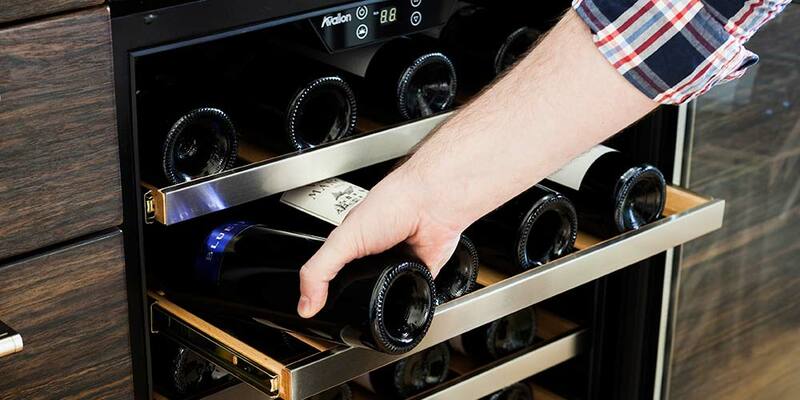 You can store up to 53 standard 750 mL wine bottles in this undercounter wine cooler, which makes this the perfect cooler for wine novices and aficionados alike. Keep your wines chilled to perfection using the EdgeStar 30 Bottle Built-In Wine Cooler (CWR301SZ). You can store up to 30 standard 750 mL wine bottles in this undercounter wine cooler, which is perfect for wine novices and aficionados alike. Keep your red and white wines chilled to a perfect temperature with the EdgeStar 46 Bottle Dual Zone Stainless Steel Built-In Wine Cooler (CWR461DZ). Perfect for budding wine collections or selected favorites, you can store and display up to 46 standard 750 mL wine bottles. Keep both your red and white wines stored at their optimal temperatures using the EdgeStar 36 Bottle Built-In Dual Zone French Door Wine Cooler (CWR361FD). With two separate temperature zones and a capacity of 36 standard 750 mL wine bottles, this stylish wine cooler meets all of your wine storage and cooling needs. Keep your red and white wines chilled to a perfect temperature with the EdgeStar 26 Bottle Dual Zone Stainless Steel Built-In Wine Cooler (CWR262DZ). Perfect for budding wine collections or selected favorites, you can store and display up to 26 standard 750 mL wine bottles. 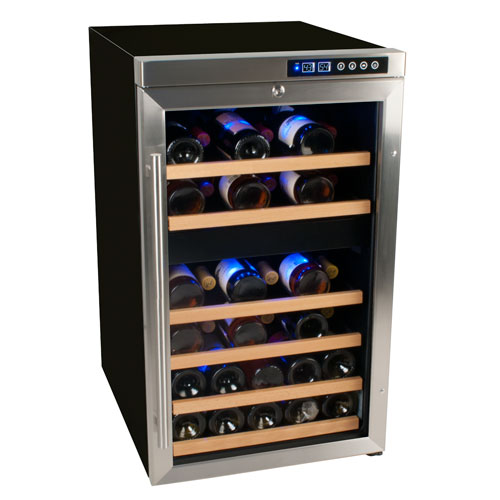 Slim, sleek and stylish, the EdgeStar 12-Inch 18 Bottle Built-In Wine Cooler (CWR181SZ) has it all. Able to hold up to 18 standard 750 mL wine bottles, this wine refrigerator is the perfect way to always have perfectly chilled wine on-hand. Store your wines in the Edgestar 34 Bottle Free Standing Wine Cooler (CWF340DZ) and keep them chilled to perfection no matter what types they are. 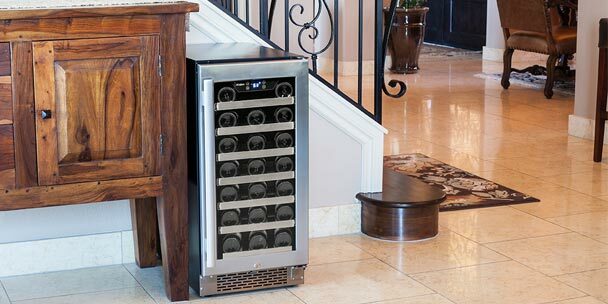 This dual temperature zone wine cooler can hold up to 34 standard wine bottles, and has two (2) separate temperature zones to chill both white and red wines at different temperatures.